I love the way this book makes it simple for children and adults to learn, review and refresh the rules of the English language. The author uses a chapter book approach to highlight parts of speech, sentence structure, modifiers, word agreement, punctuation, and confusing words. Robinson strives to leave no stone unturned. She even tackles ellipsis, brackets, braces, quotation marks, and em and en hyphens, which most readers of this book probably never knew existed. Who doesn’t love a challenge? At the end of each section, the author provides a mini quiz to test comprehension. When the reader finally reaches the end of the book, there is a mastery test on the contents of the entire book. 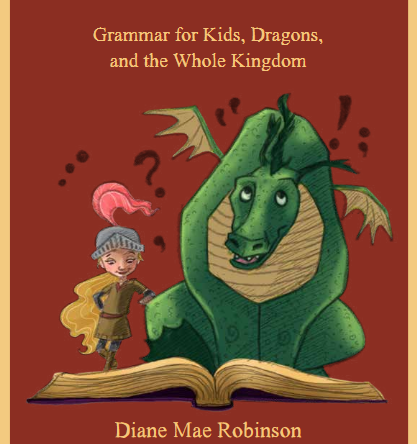 Robinson links her content to her children’s book series based on Princess Petra and her dragon friend. Illustrations spice up the lessons and make them fun. Readers are invited to sign up for a free coloring book. I would highly recommend this book for ages nine through ninety-nine. Keep it on your shelf to sharpen your skills and make your writing sparkle.